Catnip has a long history of medicinal use. Most often it is referred to as a sleep aid. And, if you think about the cat who finds the plant, that is almost always how he ends up, asleep. The relaxing properties for felines are preceded by euphoric lolling about. They get their pleasure from the scent and, while some do ingest it, most just roll and roll and roll in it. Humans are not so lucky. We could smell it all day and not feel a bit more relaxed. We must drink it as a tea or use a few leaves in dinner. Since you and your kitty will be ingesting it or rolling in it, growing your Catnip organically is the only safe way to go. Once kitty finds your Catnip plants, you will have to watch they aren't mauled to death. When you transplant them, don't leave the dirt under them bare. Mulch with a large bark or something similar. Bare, freshly dug dirt is a great attractant for cats. You might even want to build Kitty an outside sand box away from the garden so she is more tempted to hang out there. 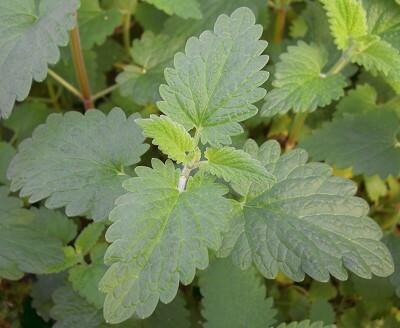 Catnip is easy to grow and gets about three feet by three feet. Kind of a rangy looking plant, it is best planted at the back of the garden. Catnip dies back to the ground in winter but returns in the spring. Leaves can be harvested anytime, but according to Rodale's Illustrated Encyclopedia of Herbs the best time to harvest is in late summer when the plant is in full bloom. You say Catnip and I say Catmint. Well, let's start by saying that Catnip is a member of the mint family. 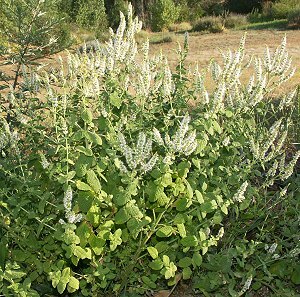 Then let's say that there are other members of the same Genus as Catnip, the Nepeta genus. Then we need to point out that folks in Europe and folks in America DON'T use the same common terms. In Europe, the lowly Catnip plant is often called Catmint because not only does it attract cats but because it is also minty. They also use the term catnep, with an e instead of an i. Then in America we take the term Catnep and make it Catnip. But, what about the term Catmint? That we, Americans, save for the other members of the Nepeta genus, like Giant Catmint, and Siberian Catmint. We never call these Catnips. We use the term Catnip with those Nepetas that are of the species cataria, of which we know of only two (Catnip and Lemon Catnip). What about Catmints in Europe? Well they call all the same ones we call Catmints Catmints, but they also sometimes call Catnip Catmint. And, what about the kitties? Well, they don't really care what we call it and they seem to really only go for the Nepeta catarias. The other Nepetas are low in the volatile oil, Nepetalactone, that makes them go wild over Catnips. If your kitty doesn't like Catnip, there are other herbs he may go for. Check out our Newsletter Prized Pet Plants. Catnip makes a great addition to our Tea Herb Garden Six Pack and our Edible Flower Garden Six Pack. This plant is often available in plug trays. These trays hold 128 of all the same plant. They are a great low cost way to fill a lot of space. Each cell is 3/4 of inch by an inch. Check here to see if Catnip Plug Trays are available.